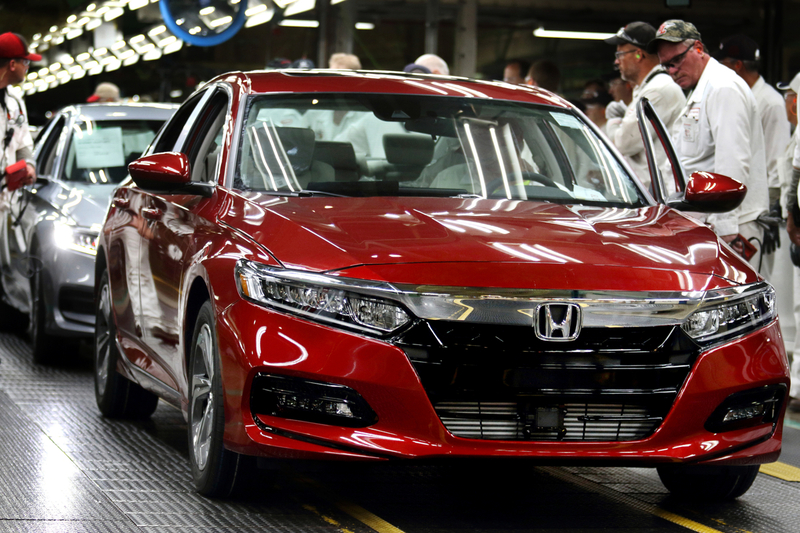 Honda finished 2018 with production of 1,820,779 automobiles in North America, which included a 2.7 percent increase in U.S. automobile production of 1,240,487 Honda and Acura cars and light trucks. As a result, the company's 2018 U.S. auto sales were 91.9 percent North America-made, with U.S.-made vehicles representing nearly two-thirds (64.6 percent) of U.S. sales. Total North American auto production fell 1.7 percent as the Celaya, Mexico plant lost four months of production while recovering from flooding that struck on June 28. Production at Honda's two auto plants in Canada rose 0.6 percent to 432,771 vehicles for the year. The introduction of the new Indiana-made Insight hybrid sedan, along with the Ohio-made Accord Hybrid, Acura MDX Sport Hybrid and Acura NSX, led Honda to a new record for U.S. electrified vehicle sales in 2018, up 89 percent from the previous year to 52,880 hybrid, plug-in hybrid and fuel cell vehicles. This included significant innovations for production of electrified vehicles and powertrain components, including $61.5 million in Indiana and Honda's Russells Point, Ohio transmission plant for the production of the all-new Insight and its hybrid power unit. This marks the first time Honda has manufactured key components of its innovative two-motor hybrid power unit in America. In addition, the hybrid battery packs for both Insight and Accord are assembled at the Marysville Auto Plant. Honda has also leveraged its flexible manufacturing capacity to shift its production mix toward SUVs to achieve record production of light trucks in America. Last summer, the company added production of CR-V to its Marysville, Ohio plant, the fourth plant in North America to build CR-V, which helped CR-V to a second straight record year and an all-time best month in December 2018. Prior to that, in late 2017, the company completed the transfer of Acura MDX from Alabama to Ohio, which resulted in increased supplies of Pilot from the Alabama plant, helping boost U.S. sales of Pilot by 25 percent in 2018. With the transfer of Acura MDX production to the East Liberty Auto Plant, the company has now consolidated U.S. production of Acura vehicles in its three Ohio auto plants – the Marysville Auto Plant (TLX and ILX), the East Liberty Auto Plant (RDX and MDX), and the Performance Manufacturing Center (NSX) in Marysville. In 2018, five of six Acura models were made in America, comprising 99 percent of Acura's U.S. sales. Moreover, Acura's newest Ohio-made vehicle, the 2019 RDX, has enjoyed tremendous early success with seven consecutive record sales months (June-December). Honda completed more than $174 million in expansion and innovation activities at its U.S. plants in 2018, totaling $5.9 billion new capital investments in Honda's U.S. production operations undertaken over the past five years. In addition to the $65 million invested in U.S. electrified vehicle and powertrain production, new U.S. production investments in 2018 included $54 million in the company's East Liberty, Ohio auto plant for production of the new Acura RDX, a $10.5 million expansion of the Swepsonville, North Carolina power equipment plant, and a $45 million expansion of the Timmonsville, South Carolina powersports plant, including 250 new jobs, to support increased production of Honda ATVs and side-by-sides. Honda also has begun production of two new U.S.-made products slated for launch early in 2019. The 2019 Honda Passport SUV, going on sale early this year, went into production in December 2018 at the company's Lincoln, Alabama plant alongside the Honda Pilot SUV, Odyssey minivan and Ridgeline pickup. As a key new addition to its growing side-by-side lineup, the company's Timmonsville, South Carolina plant began production of the all-new Talon sport side-by-side, launching this spring. Honda will mark its 40th anniversary of manufacturing products in America in Sept. 2019. Honda was the first Japanese automaker to produce products in America in 1979, followed by the start of automobile production in Marysville, Ohio, on Nov. 1, 1982. Over the course of four decades, Honda has steadily grown its manufacturing capabilities in the region. Honda now employs more than 25,000 associates at 19 plants in North America with the capacity to produce more than 1.92 million automobiles, three million engines, 400,000 power equipment products and 330,000 powersports products each year, using domestic and globally sourced parts. In 2018, more than 90 percent of all Honda and Acura automobiles sold in the U.S. were made in North America, and nearly two-thirds were made in the U.S., using domestic and globally sourced parts. Honda also manufactures the HondaJet advanced light jet and GE Honda HF120 turbofan engines in America. Cumulatively, Honda has invested more than $22 billion in its North American manufacturing capabilities, including more than $5.9 billion over the past five years. The company also works with more than 650 original equipment suppliers in North America with cumulative parts purchases exceeding $415 billion over 35 years.